The Australian manufacturing sector continued to retract with another month of job losses and negative sentiment even after the federal government stepped in, announcing approximately $1 billion in support of a number of initiatives including dedicated manufacturing hubs and local content requirements for major projects. R&D tax concessions would be cut to offset the costs of the new programs. The announcements made by the Prime Minister, Julia Gillard and the Minister for Industry and Innovation, Greg Combet were largely drowned out by more Labor leadership speculation. That being said, any announcement that concerns manufacturing with its long implementation lead times has the upcoming federal election (due on the 14th September 2013) as a backdrop. Further to that, any announcement made by the current government also has to be considered very carefully by the sector given that with most polls now showing Labour has a 2-party preferred of just 31% they would be suffering a devastating defeat. Figure 1: Australian Manufacturing Workforce Planning Scan (Jan – Feb 2013). Source: Manufacturing Monthly. Some stories have been verified against primary resources. Figure 2: Australian Manufacturing Workforce Planning Positive/Negative Index (Jan – Feb 2013). Source: Manufacturing Monthly. The four most dominant Workforce Planning issues for February were Employment (30.2%), IR (15.1%), then Engagement and WH&S both of which finished at 11.3%. Only Engagement (+3) and L&D/R&D (+1) finished the month in positive sentiment territory while Employment again finished negatively (-12) followed by WH&S (-4). The Employment category which tracks employment gains, losses and general sentiment continued to dominate the manufacturing news. Representing 30.2% of all WFP stories (-17.2%mom), this included 11-negative stories offset by just 3-positives. This month the job losses were 1600 compared with just 42-added. I did include the 650-jobs which might have been created by Fresh Bins which were targeted for Victoria. According to the company’s founder, Paul Sewell, a lack of support from local and state governments forced him to relocate to Texas. With my Manufacturing Workforce Planning Scan data going back as far as May this is the 9th consecutive month of negative employment sentiment in which time 8,590 jobs have been lost, an average of 954 per month. 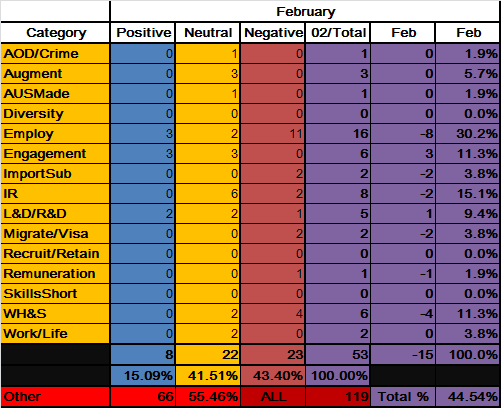 IR which tracks all aspects of industrial relations was the second leading category for February at 15.1% (+4.6%mom) due in large part to ongoing commentary and engagement by union leaders (4-stories) and two negative stories which were linked to medical manufacturing. The story which was most notable was Alan Kohler’s discussion on Inside Business with Cochlear CEO, Chris Roberts. I’m a big fan of Inside Business and an avid watcher so I was struck by Chris Roberts carefully worded criticism of Australian IR and productivity. Although he would not be directly called on offshoring I got the sense that it’s a decision on his and the Cochlear Board’s mind. Equal third on 11.3% for February were Engagement (-2.9%mom), which includes items such as exhibitions and staff awards and WH&S (+0.8%mom) which covers all aspects of Work, Health and Safety. For a sector in trouble, manufacturing loves award ceremonies and conferences and this was reflected again in this month’s positive +3 Engagement sentiment (steady from January). Unfortunately, the -4 WH&S sentiment included another factory death, this time in Western Australia (the second consecutive month were a death has been reported) and a serious injury of a worker in a mushroom factory in Melbourne. Here is a look at the February data. Table 1: Data for Australian Manufacturing Workforce Planning Scan (Jan – Feb 2013). Source: Manufacturing Monthly. Finally, here is a look at the Employment Gains/Losses tracker for 2013. Table 2: Manufacturing employment gains and losses for 2013. Source: Manufacturing Monthly.